SEOUL, Nov. 27 (KATAKAMI / Yonhap) — South Korean President Lee Myung-bak was presiding over a security-related meeting on Saturday to check follow-up measures after North Korea fired a barrage of shots on a South Korean island earlier this week, officials said. Lee was discussing measures to counter another possible North Korean attack and studying ways to levy sanctions on the communist state, according to the officials. On Tuesday, North Korea fired artillery on Yeonpyeong Island, a populated island in the Yellow Sea, killing four people, including two civilians. The North Korea’s attack marked the first civilian deaths in an attack since the bombing of a South Korean airliner in 1987. 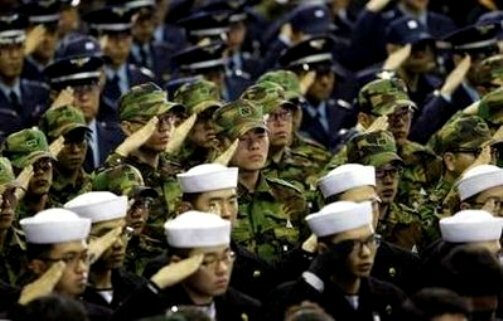 South Korea and the U.S. were set to launch large-scale naval exercises Sunday in another potent show of force against North Korea. 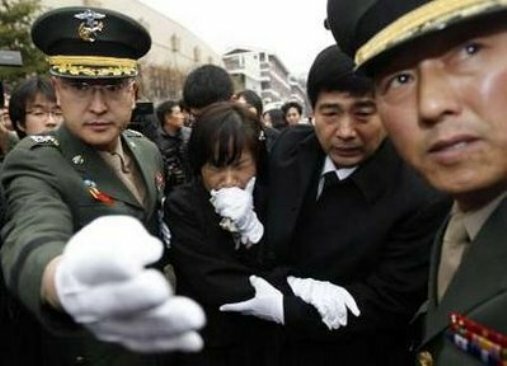 November 27, 2010 SEONGNAM, South Korea (KATAKAMI / AP) – South Korea’s marine commander vowed severe revenge at a funeral Saturday for two marines killed in a North Korean bombardment, as the country prepared military maneuvers with the U.S. that have enraged the North and concerned China. 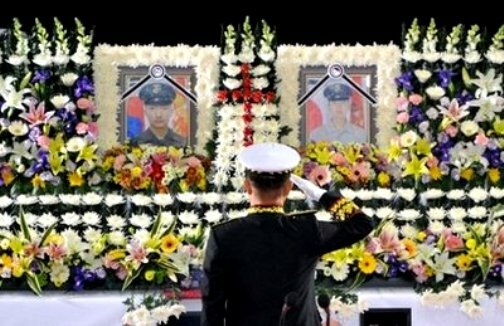 The commander, Maj. Gen. You Nak-jun, said the retaliation would be “thousand-fold” as dignitaries and relatives laid white flowers at a funeral altar following Tuesday’s attack on a South Korean island, which also killed two civilians in one of the worst artillery attacks on the country’s territory since the 1950-53 Korean War. As protesters in Seoul demanded their government take sterner action against North Korea, the North issued new warnings against the war games scheduled to start Sunday with a U.S. nuclear-powered aircraft carrier in the Yellow Sea. China, under pressure from the U.S. and South Korea to rein in its ally Pyongyang, urged both sides to show restraint while Washington played down the belligerent rhetoric, noting that the weekend war games were routine and planned well before last week’s attack. “The pressing task now is to put the situation under control and prevent a recurrence of similar incidents,” Chinese Foreign Minister Yang Jiechi told U.S. Secretary of State Hillary Rodham Clinton by phone, according to the ministry’s website. The North’s artillery fire Tuesday destroyed civilian homes as well as military bases on Yeonpyeong Island in a major escalation of their sporadic skirmishes along the disputed sea border. 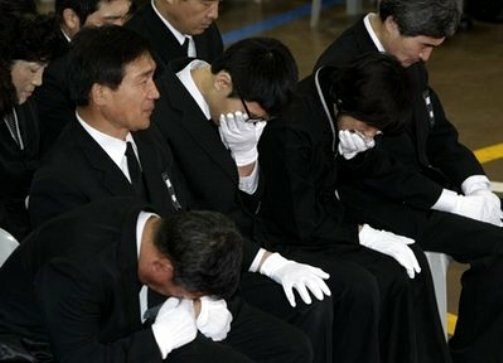 The attack — eight months after a torpedo sank a South Korean warship, killing 46 sailors — laid bare Seoul’s weaknesses in defense 60 years after the Korean War. North Korea does not recognize the maritime border drawn by the U.N. at the close of the three-year war in 1953, and considers the waters around Yeonpyeong Island, just 7 miles (11 kilometers) from its shores, as its territory. The heightened animosity between the Koreas comes as the nuclear-armed North undergoes a delicate transition of power from leader Kim Jong Il to his young, inexperienced son Kim Jong Un, who is in his late 20s and is expected to eventually succeed his ailing father. Tuesday’s attack came days after North Korea revealed a new uranium enrichment program that could improve its ability to make and deliver nuclear weapons, sending the message that new regime is as tough and unpredictable as ever and highlighting the urgency of restarting disarmament talks with the North. 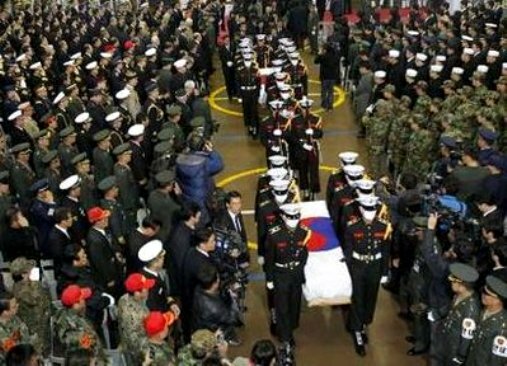 South Korea’s government, meanwhile, struggled to recoup from the surprise attacks, firing one defense minister and naming a new one Friday. About former 70 special forces troops, wearing white head bands, scuffled with riot police in front of the Defense Ministry to protest what they called the government’s weak response to the attacks, pummeling the riot troops’ helmets with wooden stakes and spraying fire extinguishers. “Let’s go!” the activists shouted. The police, numbering several hundreds, pushed back with shields. Elsewhere in Seoul several hundred activists held a peaceful, but noisy rally to denounce North Korea. China’s foreign minister met with the North Korean ambassador to Beijing, Chinese state media said — an apparent effort to trumpet China’s role as a responsible actor, and placate the U.S. and the South. 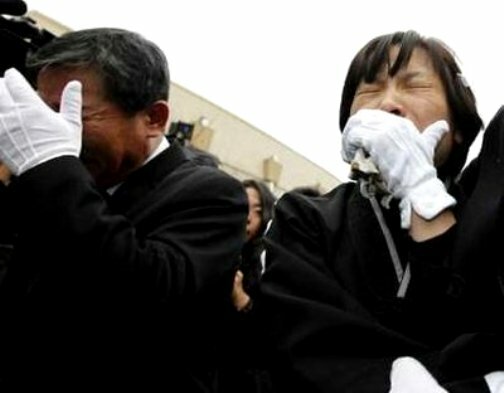 China has expressed mild concern about the impending war games, in contrast to its strong protests over earlier rounds. “The Chinese government is trying to send Pyongyang a signal that if they continue to be so provocative, China will just leave the North Koreans to themselves,” said Zhu Feng, director of Peking University’s Center for International and Strategic Studies. China is impoverished North Korea’s biggest benefactor and one of its only allies. In Washington, the Pentagon played down any notion that the weekend maneuvers with South Korea — set to include the USS George Washington supercarrier — were a provocation. 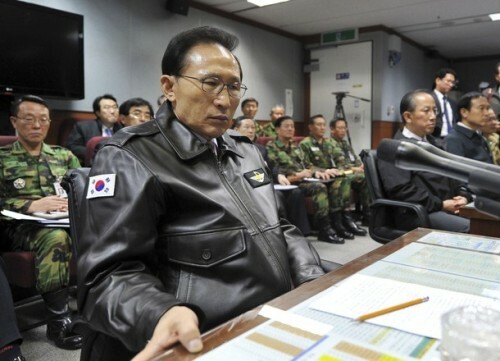 President Lee Myung-bak also has ordered reinforcements for the 4,000 troops on Yeonpyeong and four other Yellow Sea islands, as well as top-level weaponry and upgraded rules of engagement. Most of the islanders fled to the mainland after Tuesday’s hail of artillery set off fierce blazes that destroyed many of their communities. It will take six months to two years for island communities to rebuild, disaster relief official Kim Sang-ryul said. 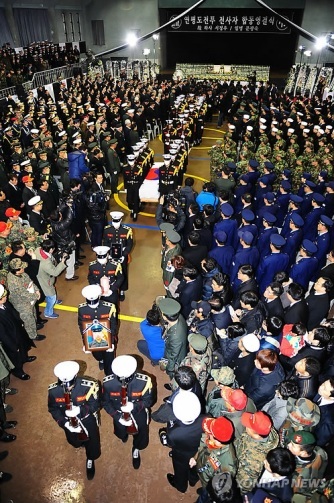 In Seongnam, near Seoul, South Korea’s prime minister and marine commander joined some 600 mourners attending the funeral for the two dead marines at a packed gymnasium at a military hospital. As a brass band played somber music, they placed chrysanthemums — a traditional mourning flower — before framed photographs of the two men, posthumously promoted and awarded medals of valor. One marine’s mother pressed her hand to her mouth, and fell forward in her seat in grief. “Our marine corps … will carry out a hundred- or thousand-fold” retaliation against North Korea for Tuesday’s attack, said You, the marine commander. He did not elaborate. 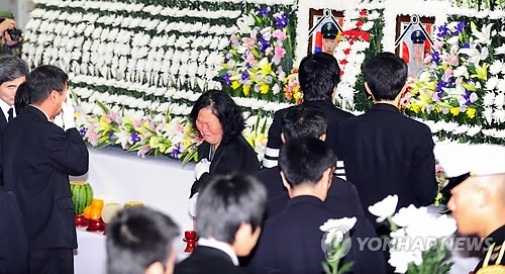 Passersby paused at Seoul’s main train station to watch funeral footage on a big screen.